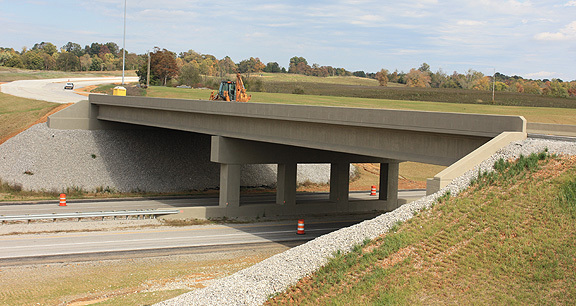 Project obstacles and solutions: The fifth and final leg of the Glasgow outer loop project connects the Cumberland Parkway with the northern route around the city. The project began 10 years ago. Key to completing this project was the building of two bridges - one over the highway and the other over Beaver Creek. Scott and Murphy were contracted to build both of these bridges. The Beaver Creek bridge was a five-span bridge over 500 feet long. The bridge deck is 100 feet over the creek at its highest point. The Cumberland Parkway bridge is 250 feet long. Both bridges were cast-in-place. The piers, caps, abutments and decks were all formed and poured using 6,300 yards of concrete. One of the biggest challenges on this project was gaining access to the site. The road had yet to be built to the bridges and the banks down to Beaver Creek are steep. Scott and Murphy brought in two concrete pumps during the pouring of the piers. Concrete was delivered to the upper pump, which moved the mix down to a lower pump, that in turn moved the concrete into the pier forms. IMI QC/QA engineered a mix that would flow through both pumps without losing air entrainment as it was being placed. The final leg of the Glasgow outer loop is scheduled to open in the spring of 2015.